Guys don’t write like that. Besides the obvious fact that they cannot give birth to babies, it is not the way men are wired. “My body needs my town” is pretty incomprehensible to most men. While their minds are busy solving problems, their bodies are along for the ride. Body and mind are not integrated as they are in women. Men’s bodies do not follow the lunar cycle. They do not produce beings, which leaves them often confounded by the intuition of mothers. This is a problem. In Hebrew the word wisdom is grammatically feminine. That is the reason the Book of Proverbs refers to wisdom as “she.” Men in the Evangelical church do not allow women into positions of formal leadership. Should we be surprised those leadership structures are so often lacking in wisdom? Only half of the image of God is in the room. The absence of the other half is painfully obvious. When Jen made the impassioned plea of a wise woman, my immediate response was to fear the men in the room might find it lacking. Where were the facts and figures, the measurements that would sell her presentation? I began speaking to the group about demographics and return on investment. I spoke to the left brained humans in the room. I spoke like a man. I was afraid the words of a mother were not enough. I should have known better. Cathy, the mother of our three children, rarely speaks up in a business meeting. She listens. She takes in the words, body language and unspoken needs of the others in the room. She takes them into her body and processes them with her being. When she does finally speak, it is with wisdom, clarity and insight. After I spoke at One Church in Chandler, Arizona last Sunday, I spent the afternoon with Ryan Gear, the founding pastor. 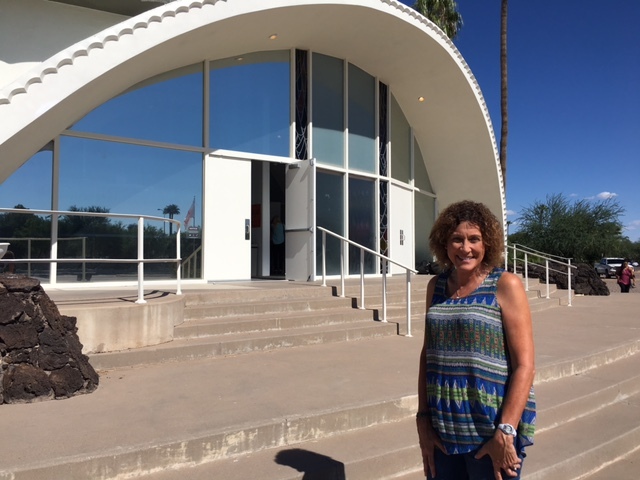 As we drove through Scottsdale we stopped at The Trinity Church, the new congregation begun by Mark Driscoll, the pastor recently removed from his megachurch in Seattle. The building was filled with women attending a “women’s event.” Ryan and I walked around. I used the restroom, which was strangely satisfying, using the women’s restroom at Mark Driscoll’s church. Ryan took a photo of me in front of the building (pictured below.) Then we left, pondering a theology that says women’s voices are only for other women, while a man like Mark gets to speak to everyone. In my new life I spend a lot of time with mothers, collecting their wisdom. They are experts in paying attention, grounded by compassion and empathy. They are slow to speak and quick to serve. They intuitively meet the needs of others before attending to their own. They look a lot like Jesus. So one more time, why doesn’t the Evangelical church place women right where they belong, smack dab in the middle of the decision making process? I know the answer to that question is rooted in the reluctance of existing power structures to give up their power. Alas, I was once a willing participant in the existing power structures. But that is a conversation for another day, maybe we’ll call it lesson #552 . Born male this message about the way your friend Jen felt rouses me as something wonderful, but I would be less than honest to say I am able to initiate such thoughts. And it hurts a bit to feel left out of such a way of thinking/feeling. Such is life. As to church thinking on the role of women, Paula as a Catholic I have nothing to teach Evangelicals. I think the Spirit is working through the wider secular community in the way it sees women’s power and roles and in time even churches will see the light. Thank you for this post. I still fall into the trap of discounting my words because I’m “just” a mom. I’m learning to be more confident (something I didn’t struggle with so much before adding this title) and I thank you for these affirming words. It doesn’t surprise me that you feel that way. But I imagine once you do open your mouth, most men in the room stand back and take notice. You are one intelligent woman! I often think of what could be accomplished in the independent Christian churches if women were elders, deacons, board members. I feel like we are supposed to check our brains at the door as we enter the church. But please tithe from your high income job as the offering plate is passed–that you are not allowed to pass, but a 12 year old boy can. Amazing that I didn’t think this was unusual growing up in the church.